Friday Night Lights came and went last week without the Florida Gators landing a single 2019 commitment, though there were some whispers that a big name would be making a move shortly thereafter. That finally went down Thursday as four-star athlete Diwun Black (Forest, Miss.) clipped his pledge from Ole Miss to Florida. Black (6-foot-4, 216 pounds) is rated as the nation’s 53rd overall prospect in the 247Sports Composite. He is expected to play linebacker at the next level. Black is a highly-recruited prospect with other offers from Arkansas, Mississippi State, Tennessee and USC, among others. He was a long-time target of head coach Dan Mullen with the Bulldogs and clearly remained one when the staff moved over to lead the Gators. Though he is a big addition for Florida and the Gators’ top committed player, UF remains outside the top 25 (at No. 26) in the 247Sports Composite team rankings for 2019. Florida is ranked No. 18 in average star rating, however. The Gators have also picked up a pair of 2020 prospects since FNL. 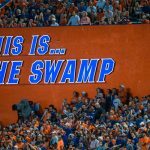 Three-star quarterback Anthony Richardson (Gainesville, FL) announced his pledge Saturday, while four-star defensive end Kedrick Bingley-Jones (Charlotte, NC) joined Florida’s class on Tuesday.